Fig. (14) WRF-UEMS Run B3 (Purde-Lin scheme) cross-section X3 in Fig. 1b at (a) 1200 UTC and (b) 1800 UTC 26 December 2003 with graupel mixing ratio (filled colors with solid black contours and black labels: 10-3 g kg-1), temperature (dashed red contours and labels: ºC), and positive vertical velocity (ω < 0: solid purple contours and labels: Pa s-1). The riming (0 to −10 °C) layer is the region of dashed blue isotherms and labels. 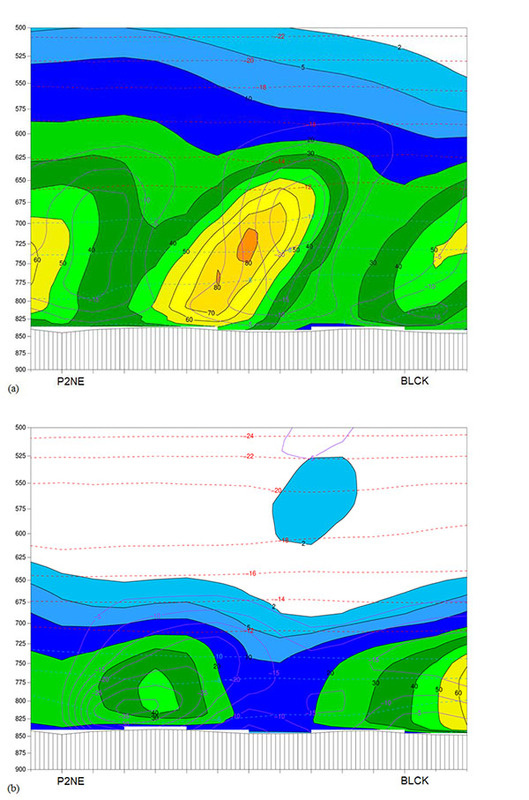 The horizontal (transect: 50 km) and vertical (pressure: hPa) axes are displayed in the figures.